We have customers who visit from Grande Ronde , Newberg , Dayton , Dundee , and Amity, Yamhill , Marion , Portland , Washington , Texas , California , Colorado , New York , Oregon , Lincoln City , Mcminnville , Hillsboro , Beaverton , Corvallis and so many more places !! If you have good credit, bad credit, or no credit call us today! 503-687-2080 !! We have very competitive financing to offer. Working with Credit Unions via CUDL , Major Banks and Local Banks . Now open is our full service facility. With two master mechanics on site your vehicle will always be in good hands. We can service your vehicle whether it's a Toyota , BMW , Audi , Subaru , Ford , Chevrolet , Dodge, Chrysler, Mercedes , GMC , Jeep , Honda, Nissan , VW , Ram , Buick , Hyundai , Kia , Infiniti , Lexus , Mazda , Pontiac , Cadillac , Diesel , Lifted or Lowered and any other brand that wasn't mentioned. This Family company is expanding and welcomes you to be apart of it. 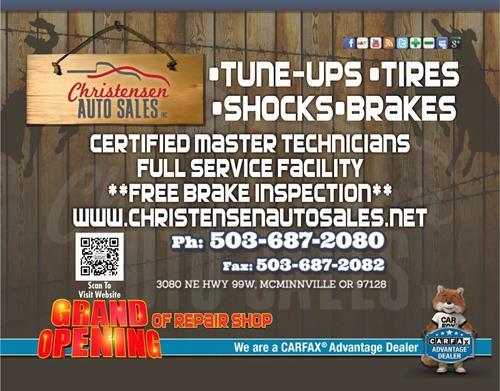 We're located at 3080 NE Hwy 99W McMinnville , OR 97128.